What could go wrong with our marriage? We all thought that on our wedding day. And your spouse just doesn’t seem as perfect. Click on the video and Kathy will explain why this happened to us and how we fixed it. To have a transformed marriage you need to deal with your own baggage. How has dealing with your baggage helped your marriage? Just leave your comments in the box below. Click here for more on how God healed our marriage. My wife moved out two months ago. The stress had become unbearable. Financial issues, lack of intimacy due to my wife’s health issues, and her son, 22, who suffers from Social Anxiety disorder to the point where he could not leave the house, has never had a job in his life and has no intentions of getting a job. We went to counselling but the counselor did not help because he did not think there was any hope for our marriage. My wife was not a Christian when we met but accepted Christ shortly after. That was as far as her faith went. I have been praying to God for direction but seem to be at a loss for answers. Is there a point where we have to say, this is not going to work, lets call it quits and move on? 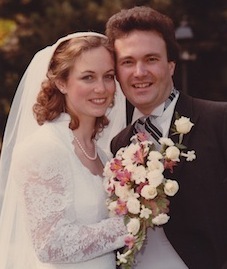 When my wife and I got married it was full of promise of a new life. But when I got sick, I’m bipolar II, it started to come apart for me. I did not see how I could be married and have this terrible illness. In fact if I could not be the man I wanted to be in my marriage I did not want to be married. I struggled with this false expectation, my mental illness and other bagish issues up until three years ago when I entered into prayer ministry and started to deal with my apostasy and painful issues. Both my wife and I expected reconciliation between us to happen but it did not. We separated 1 1/2 years ago. And now we are looking at divorce 18 years after our happy ever after. What went wrong? I took 15 years into our marriage before I started to deal with my stuff. The damage was done and even though I am now dealing with it my spouse no longer wants to be married to me. That makes both of us now. Bill, contact me for a coaching appointment. The link is below. I got married last month. It was an amazing day. I am so excited about our life together that it is a bit hard at this point to think about things like these. It is probably important to hit them in the head earlier on, but I guess I would have to wait for them to surface first? Deal with them one at a time? Or do we need to dig around for them? Ideally, these issues should have been addressed in pre marriage counselling. But that’s very rare. I suggest you go to a marriage counsellor together and say you want to get your marriage off to a great start, what areas should you be aware of or working on now. It’s preventive maintenance rather than waiting and fixing a broken relationship. We did do (she made me) a marriage course called “Marriage Without Regrets” by Precept Ministries. We quite liked it and we found issues where we disagreed. But overall, we were OK on almost all points.